FRANKFURT MUSIKMESSE 2010: While day one of Europe's biggest music equipment trade show was all about the synths - Korg's monotron and Roland's GAIA SH-01 and Lucina AX-09 models all triggered the 'want one now' impulse - day two has seen us getting acquainted with more of the most desirable new (and old) guitars on show in Frankfurt. As well as tours of the Gibson and Ibanez stands, we've been having a browse at Fender's new American Deluxe range. And speaking of Fender, you'll have to wipe the drool from your keyboard as you check out Eric Clapton's Blackie and Stevie Ray Vaughan's Lenny Strats in pictures. 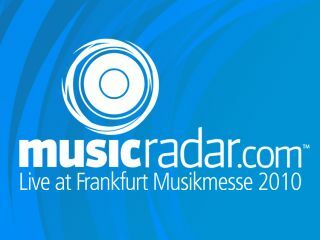 Of course, tech and drum fans are well catered for too - bookmark and keeping checking our Frankfurt Musikmesse Ultimate Guide and follow us on Twitter and Facebook and you'll never be far away from the latest Musikmesse happenings. Marshall's Natal Drums in action!